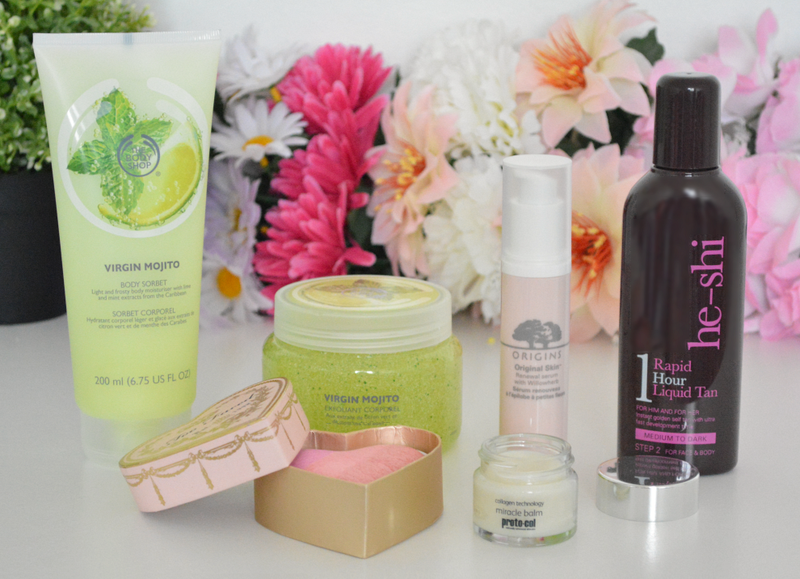 Starting with 2 new skincare favourites. My skin definitely suffered last month but thankfully Origins original skin serum and Proto-col miracle balm have helped to restore some of that radiance and hydration. I like that Origins combines the best of nature and science, the result of which is a light weight lotion which helps to refine texture and restore glow leaving my skin looking smoother and more awake. 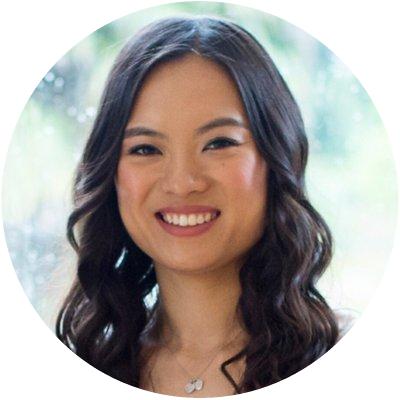 It's a quick addition to my skincare routine, but one that's made real difference. I've also been suffering from dehydration which is where the Proto-col miracle balm comes in. It's one of the lighter balms I've across across and with a blend of plant based collagen, orange oil, beeswax and vitamin E, it makes for a great lip balm as well as an intense booster for any dry flakey patches of skin. I most admit I've not the most organised of people but with the recent sunshine I've started to fake tan again. The great thing about He Shi rapid 1 hour liquid tan is that there's no need to wait overnight. I simply exfoliate and apply the tan as usual and within 60 minutes it can be rinsed off, leaving me with naturally bronzed skin. With the weather being so unpredictable in the UK this has been an absolute essential - I can get ready in the morning and by lunchtime I'm tanned and ready to go. 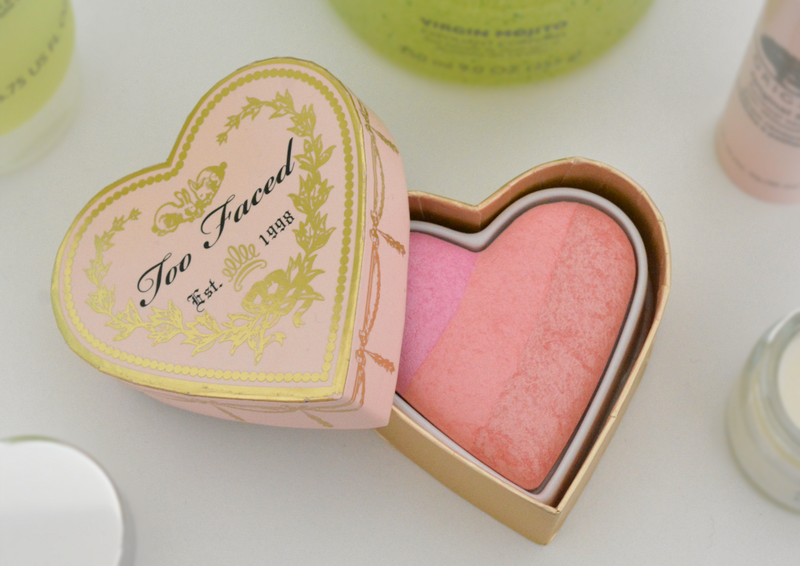 For make up I've been loving Too Faced sweethearts blush in candy glow. 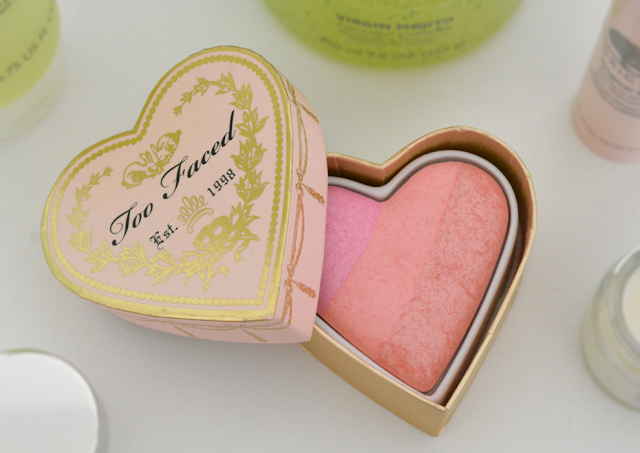 A really gorgeous baked formula which can be applied separately or swirled together for a warm flush of colour to the cheeks. My favourite's the coral shade in the middle but used together the blusher gives a lovely peachy pink glow. It's sheer but buildable and I like that there's a hint of shimmer thus doubling up as a highlighter too. Plus how cute are the candy stripes and heart shaped packaging?! Finally the new Body Shop virgin mojito range which is literally summer in a bottle. Minty fresh mojito's are one of my favourite drinks and the guys at Body Shop have managed to capture the fragrance perfectly. There's zestiness from lime, freshness from mint and of course the sweetnesss from crushed sugar. The body scrub's very gentle and suitable for daily use, but my favourite has to be body sorbet which is both cooling and hydrating on the skin. There's also a shower gel and body butter which I need to stock up on asap! Did you have a good May? What were your beauty favourites?